It was great to see so many people attend our breakfast presentation on Diversity at Work, thank you to all who came along! 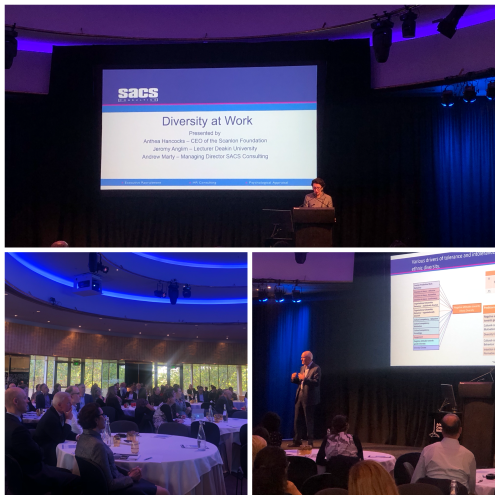 Along with Anthea Hancocks, CEO of the Scanlon Foundation and Dr Jeromy Anlgim, Lecturer at Deakin University, SACS presented the fascinating findings from our two major research undertakings which involved thousands of respondents in workplaces across Australia. We explored these results that lead to some interesting findings about the personal characteristics associated with tolerance and intolerance to diversity in the workplace and discussed their implications for recruitment efforts. We also covered the topic of “Diversity Climate” and answered a number of crucial questions on how to create a truly safe and welcoming workplace culture. Again, thank you to all who came to our session – watch this space for new innovations coming to the SACS Portal!